Blanch or steam fiddlehead ferns for a few minutes ( see fiddlehead fern page for quick tips- this step is not necessary but will ensure they won’t be bitter) Remove from pan. Meanwhile cook pasta according to package directions. ( the imported pastas we carry cook VERY quickly – so make sure to read the label) While pasta is cooking grate 1-2 ones parmesan then shave 1 oz fresh parmesan with vegetable peeler . Scoop out 1 cup of pasta cooking water in a coffee cup and reserve. Drain pasta. Add to pan with additional 2 tablespoons olive oil and grated parmesan, add in pasta water as needed to create smooth glossy pasta. 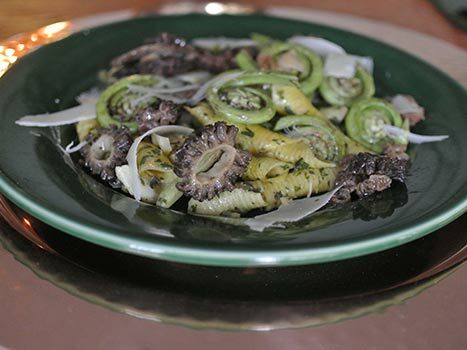 Serve with shaved parmesan and fresh cracked salt and pepper and treasure Spring!